"Dutch flag" redirects here. For the computer science problem, see Dutch national flag problem. "Flag of Holland" redirects here. For the flags of the provinces called Holland, see Flag of North Holland and Flag of South Holland. Orange field divided in four by a nassau-blue cross, showing bugle-horns of the Principality of Orange and the coat of arms of the Kingdom, surrounded by a crown and the insignia of the Military Order of William. The flag of the Netherlands (Dutch: vlag van Nederland) is a horizontal tricolour of red, white, and blue. The current design originates as a variant of the late 16th century orange-white-blue Prinsenvlag ("Prince's Flag"), evolving in the early 17th century as the red-white-blue Statenvlag ("States Flag"), the naval flag of the States-General of the Dutch Republic, making the Dutch flag perhaps the oldest tricolour flag in continuous use. It has inspired the seminal Russian and French flags. During the economic crisis of 1930s the old Prince's Flag with the colour orange gained some popularity among some people. To end the confusion, the colours red, white and blue and its official status as the national flag of the Kingdom of the Netherlands were reaffirmed by royal decree on 19 February 1937. Vruntschap of Jan van Hout (1575), the oldest known colour illustration of the Dutch flag. The flag is sticking out at the left of the top panel. The Dutch flag is almost identical to that of Luxembourg, except that it is shorter and its red and blue stripes are a darker shade. Despite the visual similarity, there is no documented relationship between the two designs. The similarity of the two flags has given rise to a national debate to change the flag of Luxembourg, initiated by Michel Wolter in 2006. At the end of the 15th century, when the majority of the Netherlands provinces were united under the Duke of Burgundy, the Cross of Burgundy Flag of the Duke of Burgundy was used for joint expeditions, which consisted of a red saltire resembling two crossed, roughly-pruned (knotted) branches, on a white field. Under the later House of Habsburg this flag remained in use. In 1568 provinces of the Low Countries rose in revolt against King Philip II of Spain, and William Prince of Orange (1533–1584) placed himself at the head of the rebels. The etymology of the House of Orange is unrelated to the name of the fruit or the colour. Usage of the colours orange, white and blue (Dutch: Oranje, Blanje, Bleu, from French Orange, Blanc, Bleu) was based on the livery of William and was first recorded in the siege of Leiden in 1574, when Dutch officers wore orange-white-blue brassards. The first known full color depiction of the flag appeared in 1575 (see image). In Ghent in 1577, William was welcomed with a number of theatrical allegories represented by a young girl wearing orange, blue and white. The first explicit reference to a naval flag in these colours is found in the ordonnances of the Admiralty of Zeeland, dated 1587, i.e. shortly after William's death. The colour combination of orange, white, and blue is commonly considered the first Dutch flag. The 400th anniversary of the introduction of the Dutch flag was commemorated in the Netherlands by the issue of a postage stamp in 1972. 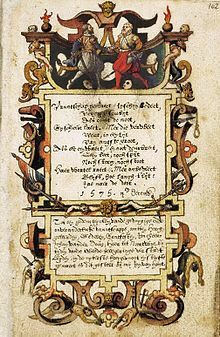 That was based on the fact that in 1572 the Watergeuzen (Gueux de mer, "Sea Beggars"), the pro-Dutch privateers, captured Den Briel in name of William, Prince of Orange. However, it is uncertain whether they took an orange-white-blue flag with them on the event, although they certainly started using an orange-white-blue tricolour somewhat later in the 1570s. It became later known as the Prinsenvlag ("Prince's flag") and served as the basis for the former South African flag, the flags of New York City and the Flag of Albany, New York, all three former dominions of the Dutch Republic. Red as replacement for orange appeared as early as 1596, but more often after about 1630, as indicated by paintings of that time. It has been suggested that this was due to the orange dye used tending to fade to red over time. It appears that prior to 1664, the red-white-blue tricolour was commonly known as the "Flag of Holland" (Hollandsche Vlag); named after one of the revolting provinces. In 1664, the States of Zeeland, one of the other revolting provinces, complained about this, and a resolution of the States-General introduced the name "States Flag" (Statenvlag). 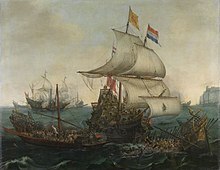 The Dutch navy between 1588 and 1630 always displayed the Prince's Flag, and after 1663 always the States Flag, with both flag variants being in use during the period of 1630–1662. The red-white-blue triband flag as used in the 17th century is said to have influenced the seminal Russian flag and the French flag. With the Batavian Revolution in the Netherlands in the last decade of the 18th century, and the subsequent conquest by the French, the name "Prince's Flag" was forbidden and the red-white-blue of the Statenvlag was the only flag allowed, analogous as is was to France's own tricolour, chosen just a few months earlier, ironically influenced by that same Statenvlag. In 1796 the red division of the flag was embellished with the figure of a Netherlands maiden, with a lion at her feet, in the upper left corner. In one hand she bore a shield with the Roman fasces and in the other a lance crowned with the cap of liberty. This flag had a life as short as that of the Batavian Republic for which it was created. Louis Bonaparte, made king of Holland by his brother the Emperor Napoleon, wished to pursue a purely Dutch policy and to respect national sentiments as much as possible. He removed the maiden of freedom from the flag and restored the old tricolour. His pro-Dutch policies led to conflicts with his brother, however, and the Netherlands were incorporated into the French Empire. In 1810 its flag was replaced by the imperial emblems. In 1813, the Netherlands regained its independence and the Prince of Orange returned from exile and contemporary newspapers report that the red-white-blue flag was flown decorated with an orange pennant and solid‐coloured orange flags were displayed in many places in the country as a sign of allegiance of the people to the House of Orange. Just before the outbreak of World War II, the Prince's flag resurfaced again. Some people were convinced that orange, white, and blue were the true colours of the Dutch flag, particularly members of the National Socialist Movement in the Netherlands. To end the discussion, a royal decree established the colours of the Dutch flag as followed: 'The colours of the flag of the Kingdom of the Netherlands are red, white and blue' (Dutch: De kleuren van de vlag van het Koninkrijk der Nederlanden zijn rood, wit en blauw). It became the shortest decree in history, and was issued by Queen Wilhelmina on February 19, 1937. It was only on 16 augustus 1949 that the exact color parameters were defined by the Ministry of the Navy as bright vermilion (red), white and cobalt blue. The pennant is usually added on King's Day (Dutch: Koningsdag, April 27) or other festive occasions related to the Royal Family. The flag is customarily flown at government buildings and military bases in the Netherlands and abroad all year round. Private use is much rarer. Only on national holidays such as Koningsdag (King's Day) is there widespread private use. At the birthday of specific members of the Royal House, like the King or the Queen, an orange pennant might be added to the flag. There are special non-holiday festivities or remembrance occasions when the flag is flown, such as at the homes of students who have just graduated. The flag is then often accompanied by the graduate's school bag hung from the tip of the flagpole. The flag can also be displayed at times of sadness at half-staff as a sign of respect or national mourning. One sees the flag often without the orange pennant, because not many people own one. The national flag of Aruba was officially adopted on March 18, 1976. The blue field represents the sky, the sea, peace, hope, Aruba's future and its ties to the past. The two narrow stripes "suggest the movement toward status aparte". One represents "the flow of tourists to sun-drenched Aruba, enriching the island as well as vacationers", the other "industry, all the minerals (gold and phosphates in the past, petroleum in the early 20th century)". In addition to sun, gold, and abundance, the yellow is also said to represent wanglo flowers. The star has particularly complex symbolism. It is vexillologically unusual in having four points, representing the four cardinal directions. These refer in turn to the many countries of origin of the people of Aruba. They also represent the four main languages of Aruba: Papiamento, Spanish, English, and Dutch. The star also represents the island itself: a land of often red soil bordered by white beaches in a blue sea. The red also represents blood shed by Arubans during war, past Indian inhabitants, patriotic love, and Brazil wood. The white also represents purity and honesty. The flag of Curaçao is a blue field with a horizontal yellow stripe slightly below the midline and two white, five-pointed stars in the canton. The blue symbolises the sea and sky (the bottom and top blue sections, respectively) divided by a yellow stroke representing the bright sun which bathes the island. The two stars represent Curaçao and Klein Curaçao, but also 'Love & Happiness'. The five points on each star symbolise the five continents from which Curaçao's people come. The Flag of Sint Maarten is the national flag of the Dutch part of Saint Martin island, which is a country within the Kingdom of the Netherlands. It was adopted on 13 June 1985. It resembles the War Flag of the Philippines. The pre-independence flag of Suriname consisted of five coloured stars (from top left clockwise: white, black, brown, yellow, and red) connected by an ellipse. The coloured stars represent the major ethnic groups that comprise the Surinamese population: the original Amerindians, the colonising Europeans, the Africans brought in as slaves to work in plantations and the Indians, Javanese and Chinese who came as indentured workers to replace the Africans who escaped slavery and settled in the hinterland. The ellipse represents the harmonious relationship amongst the groups. Within the Flag of the Netherlands Antilles there were five stars that symbolise the five islands that made up the country. While the colours red, white and blue refer to the flag of the Netherlands. A six-star version was used until 1986 when Aruba became its own country within the Kingdom. This original version was adopted on 19 November 1959. This flag fell into disuse when the Netherlands Antilles was dissolved on 10 October 2010. The Islands of St. Maarten and Curaçao obtained their separate country status within the Kingdom and the islands Bonaire, St. Eustatius and Saba are now overseas entities of the Netherlands. The Flag of New Holland, also known as the Flag of Dutch Brazil, was the flag used by the Dutch West India Company for the territories that were under its control in Brazil from 1630 until 1654. The flag consists of three horizontal stripes in the colours of the flag of the Republic of the Seven United Netherlands (red, white and blue) and it displays a monogram on the central stripe and a crown on the upper stripe, both gold-coloured. The origin of the monogram as well as its initials and its meaning is not known. For the majority of the existence of the Netherlands East Indies the flag of the Vereenigde Oost-Indische Compagnie (English: Dutch East India Company) was used. When the VOC became bankrupt and was formally dissolved in 1800. its possessions and debt were taken over by the government of the Batavian Republic. The VOC's territories became the Netherlands East Indies and were expanded over the course of the 19th century to include the whole of the Indonesian archipelago. As such the flag of the Batavian Republic and Kingdom of the Netherlands were used. The flag of the Netherlands has been said to be the origin of the Indonesian flag. To symbolise the intention of forcing out the Dutch, the Indonesian nationalists would rip apart the Dutch flag. They tore off the bottom third of the flag, and separated the red and white colours from the blue colour. The Morning Star flag (Indonesian: Bintang Kejora) represented the Netherlands New Guinea from 1 December 1961 until 1 October 1962 when the territory came under administration of the United Nations Temporary Executive Authority (UNTEA). The flag is commonly used by the West Papuan population including OPM supporters to rally self-determination human rights support and is popularly flown on 1 December each year in defiance of Indonesian domestic laws. The flag consists of a red vertical band along the hoist side, with a white five-pointed star in the center. The flag was first raised on 1 December 1961 and used until the United Nations became the territory's administrator on 1 October 1962. The flags below are influenced by the Dutch flag in colour use and design as a result of a shared history (as flags of former colonies) or economic relations, which is the case for the Russian flag. The flag of the Boer Republics, Transvaal, the Orange Free State and Natalia Republic and the flag of South Africa from 1928 to 1994 are all based on the flag of the Netherlands, or the predecessor Prince's flag. These were in turn part of the inspiration for the present South African flag. The flag of Hesse-Nassau is identical to that of the Netherlands. The Dutch royal house originates from the Duchy of Nassau. The flag of New York City, originally New Amsterdam in the Dutch colony New Netherland, was designed after the Dutch flag. The flag of Albany originally Beverwijck in the Dutch colony New Netherland, was designed after the Dutch flag. The flag of Schenectady County, New York was designed after the Dutch flag. The flag of the Municipal Council of Shanghai International Settlement included multiple flags to symbolize the foreign concessions in the Chinese city of Shanghai, where the Dutch flag is surrounding by old Swedish civil ensign, the Austrian flag and old Spanish merchant ensign. The Russian flag in turn is believed to have influenced many flags of other Slavic countries, resulting in many red-white-blue styled tribands in other parts of Europe. Peter the Great of Russia was building a new Russian Navy mostly on Dutch standards; therefore the Russian merchant flag at sea would be the inverted colours of the Dutch flag. ^ "Neerlandia. Jaargang 61". dbnl (in Dutch). Neerlandia. 1957. Retrieved 28 January 2019. ^ a b c Poels, Jos (August 2011). "The Orange Pennant: The Dutch Response to a Flag Dilemma" (PDF). Proceedings of the 24th International Congress of Vexillology, Washington, D.C., USA: 888. ^ State, Paul F. (2008). A Brief History of the Netherlands. Infobase Publishing. p. 51. ISBN 9781438108322. ^ Complete Flags of the World. Dorling Kindersley Limited. 2008. p. 121. ISBN 9781405338615. ^ "Flag of the Netherlands". Encyclopedia Britannica. Retrieved 3 February 2019. ^ "Bijlage H Maten en categorieën vlaggen Koninklijke Marine". Overheid (Dutch Government) (in Dutch). Apendix H, chapter 2. Retrieved 28 January 2019. ^ Willem, van Ham (2016). "De Prinsengeus: een vlag voor de boeg" (PDF). Vlag! (19): 19. Retrieved 28 January 2019. ^ "Europe: Netherlands — The World Factbook - Central Intelligence Agency". www.cia.gov. CIA. Retrieved 28 January 2019. ^ Worthington, Daryl (17 October 2016). "Why Are So Many Flags Red, White and Blue?". New Historian. Retrieved 28 January 2019. ^ a b Hulme, Frederick Edward (1 January 1897). The Flags of the World: Their History, Blazonry and Associations. Library of Alexandria. ISBN 9781465543110. Greenway, H. D. S. (19 August 2014). Foreign Correspondent: A Memoir. Simon and Schuster. p. 228. ISBN 9781476761329. ^ "flag of France | History & Meaning". Encyclopedia Britannica. Retrieved 3 February 2019. ^ a b Eriksen, Thomas Hylland; Jenkins, Richard (18 October 2007). Flag, Nation and Symbolism in Europe and America. Routledge. p. 23. ISBN 9781134066964. ^ a b Poels, Jos (August 2011). "The Orange Pennant: The Dutch Response to a Flag Dilemma" (PDF). Proceedings of the 24th International Congress of Vexillology, Washington, D.C., USA: 892. ^ "Flag of the Netherlands". Encyclopedia Britannica. Retrieved 28 January 2019. ^ "Change the Luxembourg flag?". luxtimes.lu. Retrieved 29 January 2019. ^ "Mars et Historia, volume 29, number 2, p. 50 ff" (PDF) (in Dutch). Archived from the original (PDF) on 8 April 2014. Retrieved 3 September 2012. ^ D.G. Muller, De oorsprong der Nederlandsche vlag, op nieuw geschiedkundig onderzocht en nagespoord, Amsterdam, 1862, p. 74. ^ a b Jean Rey, Histoire du drapeau, des couleurs et des insignes de la Monarchie française vol. 2, 1837, p. 515. ^ Jean Rey, Histoire du drapeau, des couleurs et des insignes de la Monarchie française vol. 2, 1837, p. 516. ^ "Ontwerp, postzegels Nederland 1972 Nederlandse vlag - Geheugen van Nederland". www.geheugenvannederland.nl. Retrieved 4 February 2019. ^ The CIA World Factbook 2017, Skyhorse Publishing (2016): "originally the upper band was orange, but because it tended to fade to red over time, the red shade was eventually made the permanent colour; the banner is perhaps the oldest tricolour in continuous use." ^ JC de Jonge, Geschiedenis van het Nederlandse zeewesen, deel 1. 's Gravenhage, 1833, p. 75. ^ C. de Waard, "De Nederlandsche vlag" in: Het Vaderland (1900). ^ Eriksen, Thomas Hylland; Jenkins, Richard (18 October 2007). Flag, Nation and Symbolism in Europe and America. Routledge. p. 23. ISBN 9781134066964. ^ Nicholls, David (1999). Napoleon: A Biographical Companion. ABC-CLIO. p. 34. ISBN 9780874369571. ^ Poels, Jos (28 April 2000). "Rood-wit-blauw of oranje boven". NRC (in Dutch). Retrieved 28 January 2019. ^ Wilhelmina en De Minister van Staat, Minister van Koloniën, Voorzitter van den Raad van Ministers (19 februari 1937): Koninklijk Besluit nr. 93, Zell am See. ^ "Ceremonieel & protocol - Ministeriële- en Defensie publicaties". Overheid (Dutch Government) (in Dutch). Apendix H, section 2. Retrieved 28 January 2019. ^ Indonesian flags at Flags of the World Retrieved on 2011-05-27. ^ Eriksen, Thomas Hylland; Jenkins, Richard (2007). Flag, Nation and Symbolism in Europe and America. Routledge. p. 23. ISBN 9781134066964. Retrieved 29 January 2019. Wikimedia Commons has media related to Flags of the Netherlands. This page was last edited on 22 April 2019, at 05:31 (UTC).